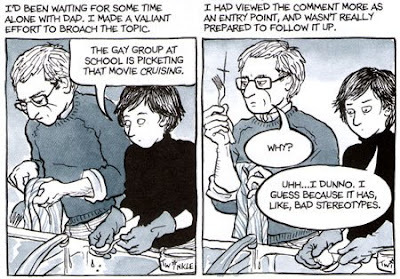 Alison Bechdel’s Fun Home is a classic graphic novel that marries memoir to the comic book. It’s a complex story told simply. Behind the simplicity is the evident hard work. The drawings are seemingly functional, but extremely nuanced. The script is simple, too, except for a few stumbling words that require a dictionary. Together, the words and the pictures create a world of characters and places that is at once warm yet distant, especially the characters. The book is about the difficult relationship between the writer and her father. She grows up in a family home that is a relic of a past that never was. It’s the father’s obsession. He spends most of his time decorating their home with Victorian furniture and knick-knacks. Unfortunately, her father dies in a hit and run accident soon after she confesses to her parents about her sexual preference. The writer thinks he’s committed suicide because of her confession of sharing his sexual orientation. There isn’t much about the mother, but that’s because she’s the strong one. She knows of her husband’s predilection, and decides she won’t let it affect her failed marriage. The book’s drawings are in all blue-tinged and create some sort of gloom, which may perhaps not be intended. 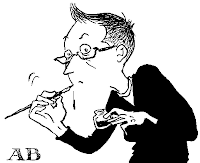 The writer’s erudition and the keen attention to detail in the drawings are really the hallmark of the book. Some of the drawings are almost pornographic but are not out of place. I found the book deeply unsettling and disturbing. This is truly a proud moment to be a Mumbaiite. I'm no longer a Mumbaiite, but am quite happy with Slumdog's near-clean sweep at Oscars Sunday evening. Mumbai is the backdrop to Slumdog Millionaire, the movie that made history yesterday winning eight Oscars. Mumbai’s Dharavi and the Victoria Terminus (now known as Chhatrpati Shivaji Terminus) are almost as important a role as the characters of the movie. The movie isn’t just about poverty and deprivation. It’s a love story; and it’s about hope. Jamal and Latika finally live happily ever after! As in any true Mumbai Hindi movie. The world's finally getting it. Mumbai's called a city of hope for this reason. It's the classic Pandora's Box story: All the diseases are out there, but there's hope (always) still in the box. That makes the city so unique. I haven’t quite understood the controversy that the movie has created in India. But I recall that even Richard Attenborough’s Gandhi the only other Hollywood Oscar winner with an India connection (it stormed the Oscars in 1982 and put Spielberg’s ET and Dustin Hoffman's Tootsie out on a limb) had faced far serious problems, with activist groups even staging protests against its filming. Just as many Indians do, I find the use of the word Bollywood to describe the Hindi film industry (based almost exclusively in Mumbai) rather disparaging and one that puts the industry firmly into the wannabe category, which it certainly isn’t. But Toronto Star isn’t expected to share such sensibilities, especially not when almost everyone – but for a small minority – refers to it as Bollywood. See the movie if you haven't yet. It'll inspire you. And you'll get to know my former home first hand. I was at a meeting earlier this week, where one of the topics discussed was the several languages of the South Asia. Hindi and Urdu are the main (and official) languages of India and Pakistan. Shorn of the excesses of linguistic Puritanism and zeal on part of the establishments in India and Pakistan to distinguish the languages (and force officialese on the people), there really isn’t any substantial difference between the two. The word Hindustani captures the true essence of how hundreds of millions of people speak Hindi and Urdu language in large swathes of South Asia. Munshi Premchand (1880-1936) and Sadat Hasan Manto (1912-1955) wrote in Hindustani. Manto used the Urdu script. Premchand alternated between Hindi and Urdu. I don’t know whether they ever met. I would imagine they must have met considering they were contemporaries and both wrote in Urdu. Both were tremendously influenced – their works indicate this in ample measures – by humanism. Both were overtly political but used literature to voice their views. Not for them the empty rhetoric of form versus content or the argument of whether art should be for art sake or should art be a catalyst for socio-political change. They were firmly believed in using art as means to highlight the ills in the society they lived in. Both were briefly involved with the Hindi film industry as writers. It’s perhaps my misfortune that I’ve read both only in English translations. I can’t read Urdu, and though I can read Hindi, I prefer to read fiction in English; I guess that’s because of habit and nothing else. I have read Premchand’s Godaan and a few short stories by Manto’s – Toba Tek Singh, Thanda Gohst (Cold Meat), among others. Manto immigrated to Pakistan after the Partition of the subcontinent, and died soon thereafter. But before his premature death – triggered I think by the acute depression caused because he had to leave Bombay – created masterpieces of prose form. Toba Tek Singh is one of them. I’m no literary expert, but I can’t think of too many parallels in world literature that can match Toba Tek Singh’s stark brutality. It evocatively depicts the lunacy of the Partition of the subcontinent through the experiences of the lunatic Toba Tek Singh. Premchand is said to have brought realism to Indian literature. Godaan’s simplicity hides the inherently unjust nature of the traditional Indian society. For a scholarly exposition on the novel, please take a look at the Literature section of Indianetzone website. The URL is: http://society.indianetzone.com/literature/1/godan.htm. The anonymous author of this piece emphasizes the new introduction to the book by Vasudha Dalmia. Premchand’s international fame is also because the foremost Indian film-maker Satyajit Ray turned two of Premchand’s works – Sadgati and Shatranj Ke Khiladi (The Chess Players) – into memorable movies. Also, several short stories of Premchand (most memorable of these was, undoubtedly Kafan) have been turned into television films by Doordarshan. 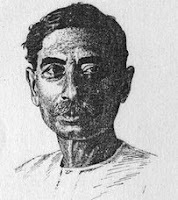 Also, while researching about Premchand on the internet, I discovered an absolutely amazing blog called Munshi Premchand’s Stories. Though it’s been just slightly over six months since I left Mumbai, it does seem a lot. 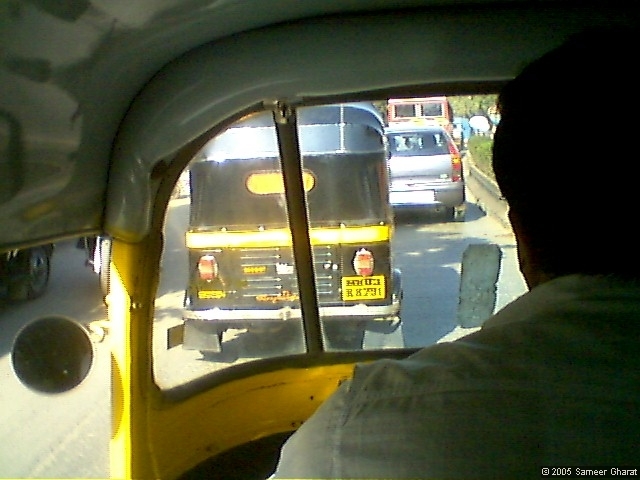 It’s not that I miss Mumbai much. I certainly don’t miss the chaos. It’s freezing cold in Toronto most of the time. But there’s order. I don’t have to sit in an autorickshaw for hours in the midst of rising automobile exhaust fumes just to reach home after work. The subway in Toronto is crowded sometimes, but never as much as Mumbai’s suburban trains. And, commuting to Oakville in the Go Trains is such a pleasure. I guess, after a few years, when the novelty of it all dies down, all these activities will become a drag and full of drudgery. But till then, I’d rather be in Toronto than in Mumbai. I received an e-mail message last week from Anju Makhija, a prominent Mumbai poet and writer. I don’t know here, but attended a scintillating session of discussion on Partition literature in which she was a participant. That was during the Kala Ghoda Art Festival in 2008. The Kala Ghoda festival is on right now. Over the last few years it has developed into a major event in Mumbai. I miss being in Mumbai because instead of participating in the Kala Ghoda festival – as a spectator – I’m reading about it in on the Kala Ghoda Gazette – the festival’s official blog. Last year, one of the highlights of the festival was the panel discussion on Partition Narratives. I attended the session primarily because Alok Bhalla (photograph) was to be one of the participants. He did not make it because of some delay. 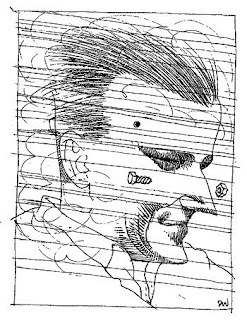 The session, even without him, turned out to be – as I said earlier -- scintillating. If you’re interested in reading my report on it, click here. Alok Bhalla is an academic. He has published extensively on translation theory, literature, and politics. I haven’t read anything by him except his Stories about the Partition of India. Partition literature is so vast, diverse and multilingual that it becomes difficult for a lay reader to come to grips with the enormity of the subject. Also, it is impossible to get good translations of these works in English. Bhalla’s one volume paperback has the best short stories from almost all major languages of South Asia in which most of the Partition Literature was (and is being) written: Bengali, Hindi, Punjabi, Urdu, and includes works of writers from Bangladesh, India and Pakistan. In fact, this book even has a short story originally written in Malayalam – a language not usually associated with Partition literature. An aside: I’m sure all Indians are aware of the Indian crabs’ story. I'm repeating it for those who haven't heard of it. It’s not necessary to close a basket carrying Indian crabs. This is because if one crab tries to get out of the basket, the other crabs will pull it down. On the authority of recent experiences in Toronto, we can safely say this is true for the entire subcontinent. Philosophy is almost always boring especially when it exceeds a few hundred words. I have not been successful in reading books on philosophy because of the dense nature of the subject. Yes, I have enjoyed reading the history of philosophy, and am particularly fond of Will Durant’s The Story of Philosophy. But serious philosophy is an obstacle to reading. Meghnad forced me (in a friendly sort of way) to read at least one book by the existential philosophers Sartre and Camus. He choose the books for me: Sartre’s Being and Nothingness and Camus’s The Outsider (The Stranger). Meghnad’s fascination for the existential was a classic mid-20th century affliction shared by many of his contemporaries. By the time I began to read books with a greater degree of seriousness, and my aversion to philosophy subsided a bit, I borrowed Robert Pirsig’s Zen and the Art of Motorcycle Maintenance: An inquiry into values. The title of the book is what attracted me to it. As I began to read it, I began to enjoy it. The book works on several levels. The most basic level is of course as a travelogue of the author's 17-day road trip on his motorbike, accompanied by his son. The other (and the more meaningful level) is as a philosophical treatise on quality. Perhaps because I was young when I first read it, or because it was the first such book that I read with interest, I read it twice. The concept of quality that Phaedrus – the book’s main character – introduces to the reader and analyzed in this book is further developed into a full-fledged theory (Metaphysics of Quality) in the second book Lila: An Inquiry into Morals. Zen and the Art of Motorcycle Maintenance was first published in 1974. It has become an institution. The Wikipedia site on the book (http://en.wikipedia.org/wiki/Zen_and_the_Art_of_Motorcycle_Maintenance) informs me that it was rejected by 121 publishers before it was published. And then went on to become one of the most widely read philosophy book ever. The reason for its amazing popularity is quite obvious: It’s written in a non-academic, story-telling style. Most serious students of philosophy have found the book seriously wanting in philosophical content, and have found the basic premise of the book questionable if not laughable. More people from my generation – those in their teens in the late 1960s and early to mid 1970s – have read Pirsig’s book than any other book on philosophy. That perhaps only means that most of those who are middle-aged right now are quite stupid, or that Pirsig had something to offer.